I recently had the pleasure of conversing with Ms. Donaldson about her books, travels, future aspirations and how she keeps everything together now. Q: You got your B.A. in English—how did your studies shape your writing? A: I studied English because I love to read and I love to dissect books and understand them in intellectual ways that go beyond simple escapism. Within my English major, I chose to emphasize British literature. It’s hard to explain why I love British literature and all things British as much as I do. I can only blame it on my blood–I am half British, half Scandinavian, and when I first set foot on British soil, I felt like I was coming home. Q: How lovely; I felt the same way visiting Medellin for the first time. Having traveled and lived in many places, how has it colored your perspective? A: I love new places and people. I’m itchy all the time for adventure. And being able to write about characters who live in a different time and place gives me a chance for the adventure I crave. And, yes, you do see things differently, and see people differently, I think, having lived in different cultures of the world. Most of all, I think moving all over has made me curious. Q: Your writing reflects that quality—the details you imbue into your writing are magical. As your second novel, how was writing and sharing Blackmoore different to your experiences with Edenbrooke? A: Writing Edenbrooke was an escape for me, and I made it as enjoyable an escape as I could. But I wanted Blackmoore to be different. It was written from a more personal place within my heart–a place of greater vulnerability. It was also a much more stressful writing experience, to be under deadline while juggling a full-time job as a mom to four young children. My sanity came into question often, and I still don’t know how it all came together in the end. Q: That sounds like a superhuman feat! You mention that you’re always dealing with multiple things and can’t necessarily respond to fan emails—what organization have you put in place to deal with everything that is going on? You’ve given us two exceptional novels in the space of two years and that takes a hefty, intelligent system of some kind, one would imagine. A: Oh my goodness, I wish that was true. My “organization” is not organized at all. But the principles I try to use involve knowing my priorities. When my kids are getting home from school, I am all mom. They are my priority. When it’s my hour to exercise, my health is my priority. When nobody has clean clothes to wear and everyone is late to school or work because they’re digging through laundry baskets, the laundry is my priority. And there has to be time set aside for my writing, or it would never get done. Thursday evenings are typically my night “off” where I can go somewhere and write. Sometimes I can grab a few hours on the weekend. At night, once the kids are in bed, that’s also when my writing is my priority. It’s a matter of spinning plates. You have to keep them all spinning, but that doesn’t mean you’re touching each plate at all times. You spin one, then move on to the next, then run to catch the one that’s about to fall….and somehow it works. It’s imperfect and messy, but it works. Q: It’s a great system. You taught a fifteen-minute class earlier this year on “How to Craft Compelling Stories”. Do you envision teaching or mentoring in any capacity in your future? A: I actually have a dream to go back to school and earn an advanced degree so I can teach at a college level. That dream has been on hold while my kids are small, but I hope it becomes a reality for me soon. Q: That will be wonderful. I would travel to study under you! 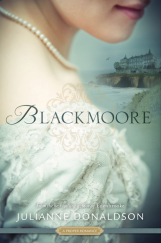 Thank you for sharing the songs you listened to while writing Blackmoore on your blog. How does music play a part in your writing process? A: Music gives me the emotions that are so important to my stories. So when I’m starting a story, I listen to lots of different kinds of music until I find the songs that spark characters or themes or scenes within my story. Then I use those songs to keep me on the right path throughout the writing and editing process. Q: On your blog, you share fan fiction that was sent to you for Edenbrooke and note that your blog “is a place of safety and positivity”; have you written fan fiction from any of your favorite novels (and might you one day share it)? A: Ha ha. No. I have never written fan fiction. I am honored, though, that someone likes my stories enough to want to continue them. To find out more about Julianne Donaldson and her works, please visit her website/blog: http://juliannedonaldson.blogspot.com/.